Fibromyalgia syndrome is a chronic (long-lasting) condition in which patients typically experience widespread pain, disrupted sleep, fatigue and impaired ability to think. Exercise is commonly recommended to patients with fibromyalgia, and research has shown that aerobic and strength training can lead to numerous improvements for them. Many patients with fibromyalgia also have balance problems, which can increase their chances for a fall, and balance training has therefore been suggested as well. Despite this, no studies have investigated balance training for fibromyalgia patients, and it has not been compared with aerobic training. For this reason, a powerful study called a randomized-controlled trial (RCT) was conducted that compared the effects of aerobic exercise training to balance training in fibromyalgia patients. Women with fibromyalgia were invited to participate and were screened, which led to 33 patients being accepted and randomly assigned to either the aerobic training or balance training group. Both programs lasted six weeks, and patients were evaluated before and after the intervention for pain, physical function, balance, exercise capacity, and quality of life (QoL). The aerobic training group performed three 20-45 minute sessions per week, and the intervention was led by a physical therapist and included a treadmill. Exercises were performed at 60-75% of patients' heart rate, and either increased or decreased in intensity based on their exertion level. The balance-training group performed three weekly 20-30 minute sessions, which consisted of exercises designed to change patients' center of gravity and improve balance. Results showed that both programs had similar positive effects on reducing pain, improving exercise capacity and enhancing QoL, but patients in the aerobic group experienced greater benefits in pain and physical function than the balance group. These findings confirm previous research that supports aerobic exercise for fibromyalgia, but also shows that balance training may serve an important purpose, as well. 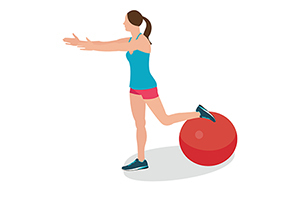 Therefore, it's suggested that the inclusion of balance training be considered in treatment programs for patients with fibromyalgia, especially those who cannot participate in a conventional aerobic exercise-training program. Doing so may lead to even greater improvements for these patients and reduce their risk for falls.